Good morning Clemson Girls and Happy Wedding Wednesday! 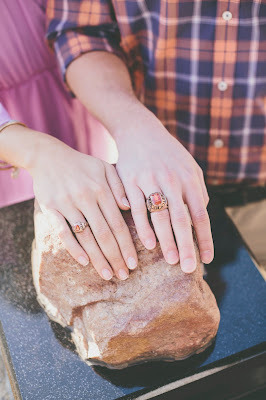 Wedding Wednesday is our series of Clemson-related wedding and engagement themed posts that will run every Wednesday through May and June. 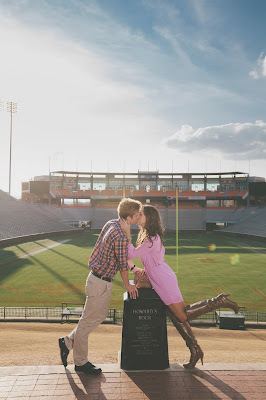 We are kicking off our Wedding Wednesday series with the most beautiful Clemson engagement photos. We are so excited to have the opportunity to share these with you today. 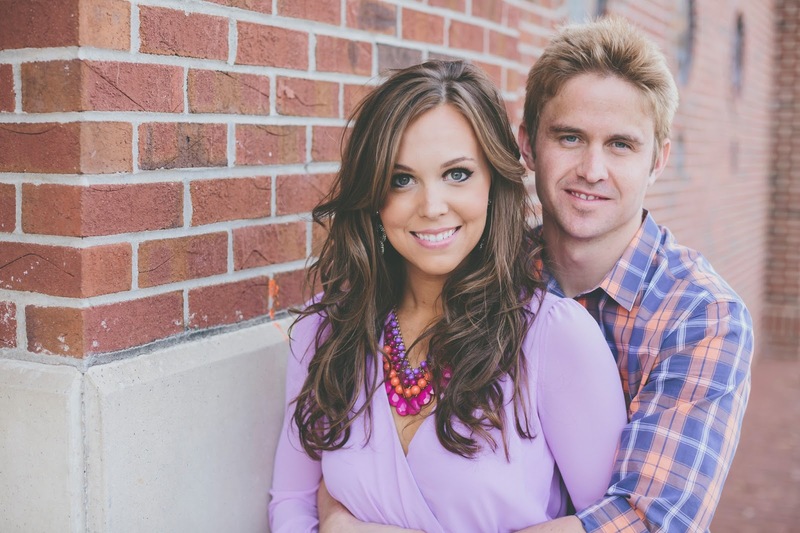 Meet Lauren and Andy -- Lauren and Andy are both Clemson alums... Andy graduated in 2008 and Lauren graduated in 2009. They were both Management Majors with a Minor in Advertising. Andy and Lauren were both members of the Clemson University swim team and they met during the first week of school during Lauren's freshman year, her very first day on campus. Keeping with tradition, the current sophomores would come by to welcome and meet the new freshman who were moving into Thornhill. Like the gentleman he is, Andy came and introduced himself to Lauren and her family. The rest was history! Our proposal was on June 15th, 2012. Lauren and I had been together for more than seven years at that point and I think we both knew this day would inevitably come. Obviously I knew it would come quicker than she did! Since our first kiss back on Halloween 2005, we’ve truly had an amazing relationship full of love, support and great times together. Unbeknownst to Lauren, I asked Don (her father) for Lauren’s hand in marriage a few months before the actual engagement when we were visiting her family up in Lancaster, PA. 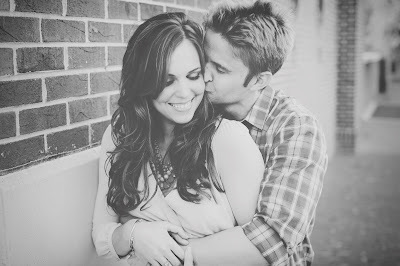 I knew, from there, the hardest part of the proposal would be keeping the secret when both of her parents knew ahead of time. 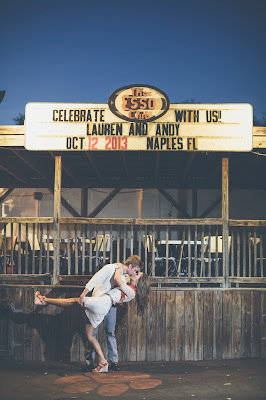 As soon as I got home to Jacksonville from Lancaster, I started planning how I wanted to ask Lauren to marry me. From the start, the one thing I knew was that Lauren would want to celebrate this special occasion with her family so the first order of business was getting her parents plane tickets to “secretly” fly down for the engagement. I told my parents to do the same. On the night of the engagement, Lauren and I both came home from work and got dressed and I drove her downtown to the Landing where I told her I made a reservation at a restaurant that she’d never been to before. I told her that we were running a little early so let’s take a walk along the river since it was such a beautiful night out. We walked for a little while and then sat down on a bench where I decided to get on one knee and ask her to marry me. As soon as she said, “Yes” a limo drove around the corner and I told her it was ours for the night. As we walked closer, the doors opened and her parents (as well as mine) hopped out of the car with champagne. Lauren was ecstatic. Both families shared some tears and some laughs and then we jumped in the limo and drove around celebrating the occasion. About an hour later we stopped for dinner at The Capital Grille. Before we went inside, I pulled the driver aside and told him he needed to go pick up our friends that were waiting outside my apartment complex for him. After dinner, we walked outside The Capital Grille; Lauren looked up and saw all of our Jacksonville friends standing by the limo with signs and drinks ready to celebrate. The rest of the night is a haze that was full of great times with great friends around the city of Jacksonville. The couple have a very special place in their heart for Clemson. Clemson was the start of their dating years (7 years to be exact! ), where they participated on the swim team, where they met new friends and created memories that will last them a lifetime. Both Andy and Lauren came from up North to go to school down South. The family atmosphere, beautiful campus, and friendly locals were a huge draw for both of them and made them feel like we were at home. 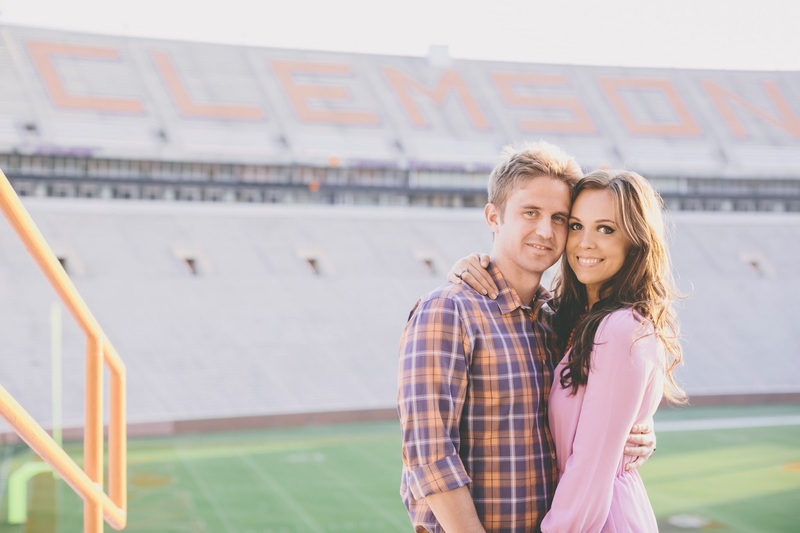 The couple are so passionate about Clemson and although we they no longer live in South Carolina, they still make a point to make it back to Tiger Town at least once a year! 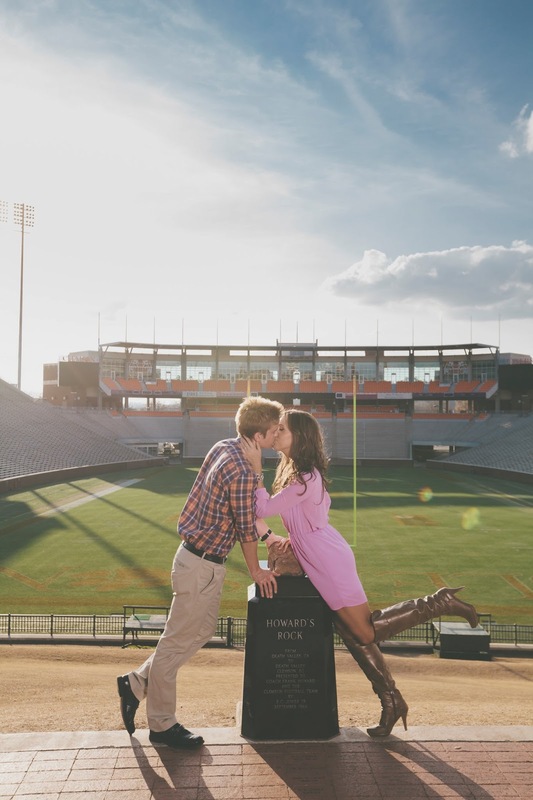 It's no surprise the couple picked Clemson as the location for their engagement photos. They wanted to be at their most favorite place in the world and have the memories captured forever! 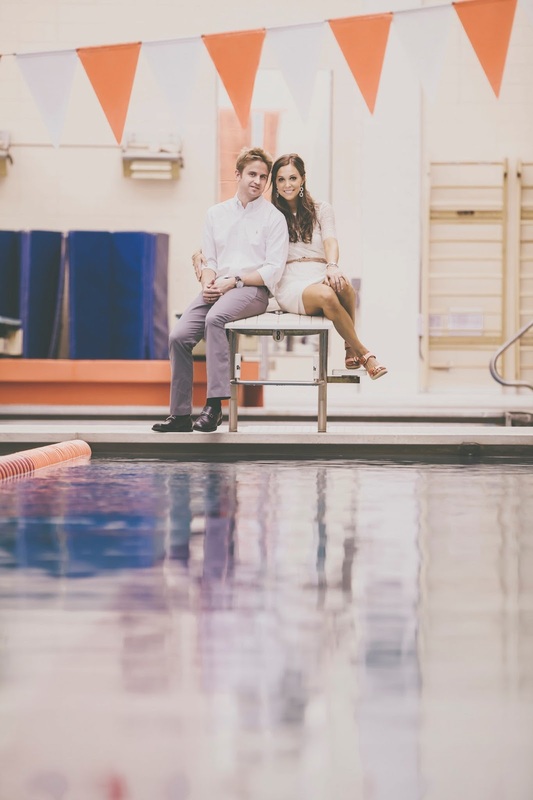 Lauren told us it was fun for them to do some photos in Fike, which was the pool in which they had spent many swim team practice hours in. The beautiful couple will be married this October in Naples, FL on the beach. The wedding colors are a twist on Clemson colors, tangerine and magenta. They will have Clemson cupcakes at the reception and Lauren says, "I am sure you will hear the Tiger Rag once or twice!" These amazing photos were taken by the talented Red Apple Tree Photography. Lauren told us, "Photographers Crystal and Keith were AMAZING and so easy to work with and we recommend them to any newly engaged couple!" A very special thank you to Lauren and Andy for sharing their amazing Clemson engagement photos with us and their wonderful Clemson love story. Best wishes and all the Clemson love in the world to this lovely couple! 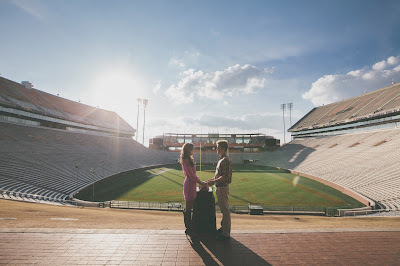 Did you have your engagement photos taken in Clemson? 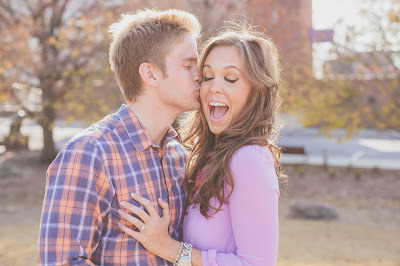 Are you a photographer who has some amazing Clemson engagement or wedding photos you would like us to share? If so, please email us at clemsongirlblog@gmail.com -- we would love to feature your photos in a future Clemson Girl Wedding Wednesday!